Oct. 19, 2016 1:00 p.m.
Derek Northcott saw his chance and took it. The former construction worker, who previously worked on Ridley Island’s Road, Rail and Utility Corridor and other projects around the North Coast wanted to leave the hard labour industry and using hard work and a wealth of knowledge from himself, his wife Kerry and a family friend in Alberta, he has now opened his own business. That venture was on display last week at the Prince Rupert and District Chamber of Commerce’s Business after Business event on Oct. 11. NC Fire and Safety inspects, audits and services high pressure cylinders like self-contained breathing apparatuses (SCBAs), dive tanks and fire extinguishers. The company also deals with Range Guard kitchen suppression systems for corporate clients and FM-200 fire suppression systems, which can be found on Coast Guard ships or Fairview Terminal’s cranes. Northcott’s grand opening of NC Fire and Safety kicks off the fall season for the Chamber of Commerce, which has a few star-studded speakers lined up for luncheons, including this Wednesday’s guest DP World’s Jim Rushton. Northcott has lived in Rupert for seven years and for the past two, has been hard at work gaining the proper certifications to service large and small corporations and services around the North Coast, including Haida Gwaii. “My wife has done the safety part in Alberta and here as well for different projects. One of the components she always found was the fire equipment was always lacking. The common answer [people would give] is ‘I called the guy and he didn’t come’ so it kind of went from there,” said Northcott last week. Northcott purchased a property on Saskatoon Avenue in May and has since renovated it to include space for his industrial equipment and van, which looks like a mini-workshop once the doors open. The Rupertite installs systems and will place clients on a semi-annual inspection rotation. The Port of Prince Rupert is among his clients. “Everyone’s aware about the fact that Prince Rupert has an amazing future. There are opportunities that people like these folks can see before their eyes. They’re not waiting for the mythical boom to happen. 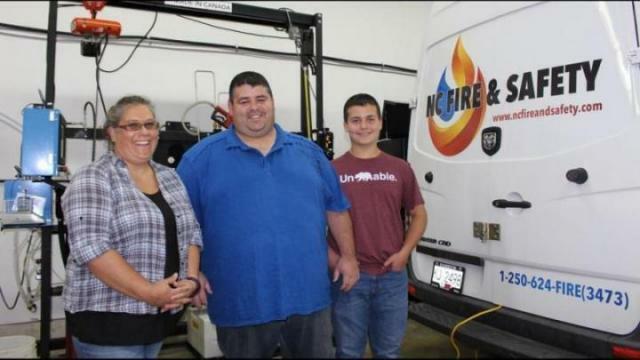 They’re aware of the fact that the opportunities exist right now in the marketplace and they’re putting their money where their mouth is, opening a new business,” said Chamber of Commerce president Keith Lambourne. Northcott is also a familiar face at the Jim Ciccone Civic Centre, as his son Ben is on the rep team, and has been for a couple years. He was the head coach of the Peewee Reps while Ben was on the team and assists the Bantams now. The team just returned from a Thanksgiving tournament in Smithers, where they faced tough (and towering) competition. Northcott is visiting Haida Gwaii this week on business and is already thinking about growing his business. “Currently there’s just the two of us, but in fairly short order we’ll be expanding pretty quickly,” he said.